Hello, and welcome to the website for Engineering Undergraduate Programs and Diversity and Outreach! I’m Daniel Burkey, Associate Dean for Undergraduate Education and Diversity. On these pages you’ll find a diverse array of information for both current and prospective students, so we invite you to explore what’s going on in the school. For our prospective students, this is an incredibly exciting time to consider studying engineering, especially here at UConn. There are an incredible number of grand challenges in science and engineering that will require our best and brightest students to tackle in the upcoming years, and both UConn and the State of Connecticut are investing heavily in STEM education at both the University and K-12 level to help meet this demand. We encourage you to come visit us, either for a personal tour via our Engineering Ambassadors program or via one of our numerous Open House events throughout the year. For our current students, we in Undergrad Programs are committed to your academic success. On this website you will find links, information, and resources for assisting you in completing your degree and beyond, including our outstanding undergraduate advising team, career services, and undergraduate programs professional staff. 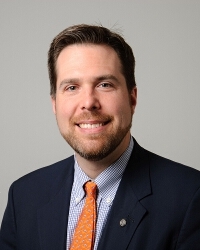 About Daniel Burkey: I joined UConn in 2010 after holding previous positions in both academics and industry. I received my Ph.D. and M.S.C.E.P from the Massachusetts Institute of Technology in 2003 and 2000, respectively, and my B.S. from Lehigh University in 1998, all in Chemical Engineering. Prior to becoming Associate Dean in 2013, I was the associate department head in Chemical and Biomolecular Engineering here at UConn, and also taught extensively in the capstone laboratory and design courses in chemical engineering. My research expertise lies in thin film polymer deposition via chemical vapor deposition, but most recently with my role as Dean has shifted to a more pedagogical focus, specifically on the use of gamification and game-based learning in engineering classes.